I’ve always been a big fan of burgers, especially adding unique toppings to make different flavor combos. However, being a vegetarian has put a bit of a damper on my willingness to eat burgers – most veggie burgers at restos are microwaved little pucks of breadcrumbs – it’s an offense to all other burgers! So when I heard about the upscale, custom-built burger joint, The Counter in Times Square (B’way /41st St), I figured I’d give myself another chance at having my heart stolen by the hamburglar. The resto is modern, but pulls off a casual vibe with snugly placed tables and a bar with games showing on their huge flat screens. We went for dinner and the place was just about full – though I can imagine it being a zoo for lunch – the advanced order form menu is most handy. 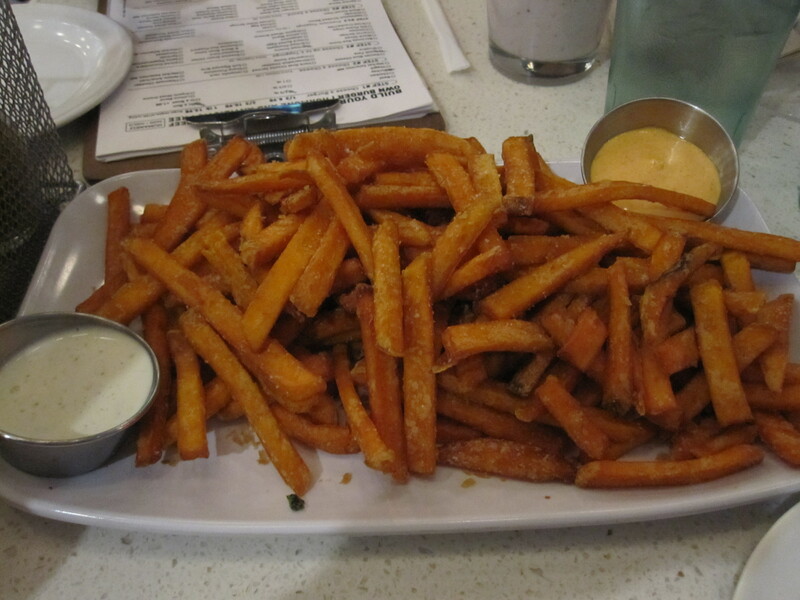 Speaking of the menu, we started with the sweet potato fries – they were AWESOME – not too fried, crispy outside, melt in yo mouth inside. 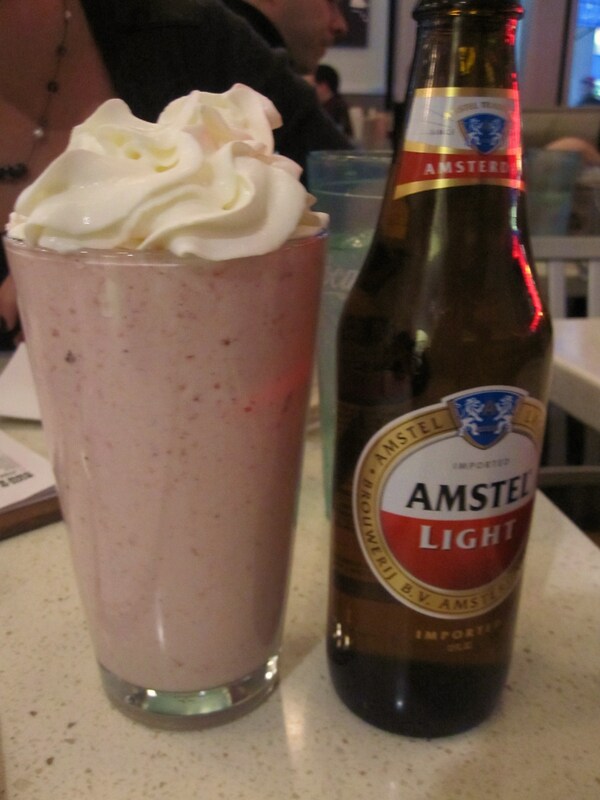 We also HAD to try one of the Boozy Adult Milkshakes – the Strawberry Shake was weak on booze, but big on flavor. 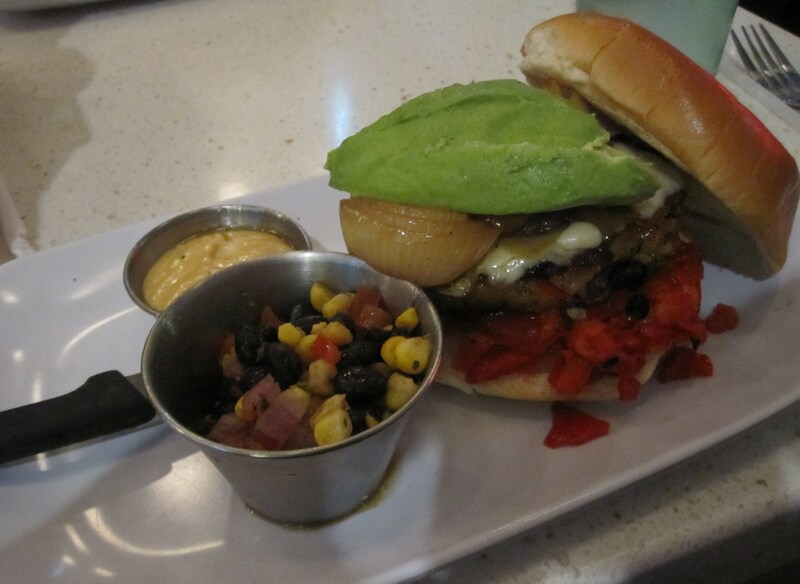 For my burger, I went Tex-Mex: a veggie patty (a properly delicious one! ), roasted red peppers, avocado, black bean+corn salsa, grilled onions and tomato, all melted beneath jalapeno jack cheese and thrown onto their classic bun smothered with chipotle aioli sauce. OMFG – they should add my creation to the signature burgers – it was that good. 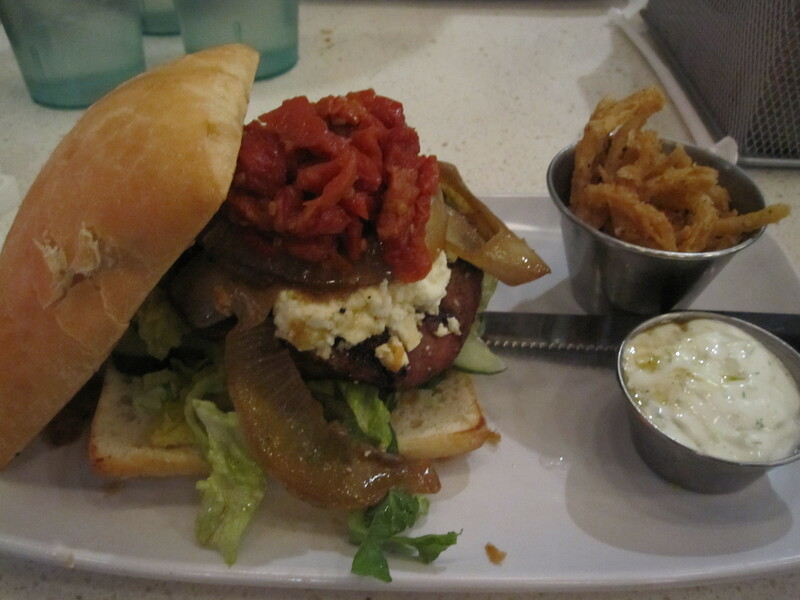 My dinner date went Greek with a turkey patty on a ciabatta roll sauced w/feta spread and topped off by hot pepperoncinis, grilled onions and sundried tomatoes, with tzatziki sauce on the side – t’was a Mediterranean delight. After my amazing (and filling) dinner, I’m certain I’d brave the lunch frenzy to partake in the tailored tastiness of The Counter Burger, or at least swing by after work again. Plus, for lighter options, you can always shed the bun and top a salad with your creation – so grab your clipboard and start building your ideal burger! Sold! I’m always looking for something I can eat in a more “mainstream” place. I’ll just hold the ailoi and cheese — everything else you had on the Tex Mex sounds perfect to me!